Introduction: Fluoride has a preventive action on dental caries. However, Excessive ingestion of fluoride from different sources can lead to the development of dental fluorosis. Aim: To estimate fluoride levels in various commercially available carbonated soft drinks available in Chandigarh city. Materials and Methods: Twelve different brands of commercially available soft drinks were purchased from three different places and divided into three groups. Fluoride levels were estimated using fluoride test strips Quantofix 37211 Fluka; Sigma-Aldrich. Results: Fluoride levels ranged from 0.12 to 0.42 mg/dl F with the maximum level in Thumbs up and least in Diet Pepsi. Conclusion: The levels of fluoride varied in various carbonated soft drinks analyzed. This could contribute significantly to the total fluoride intake from all sources and thus be an important risk factor for the development of dental fluorosis. Dental caries is one of the most prevalent and widespread disease of the oral cavity affecting every age group. Many preventive and curative measures have been documented in literature for dental caries., Among all, systemic and topical fluorides have proven to be the most effective weapon in reducing dental caries. Since 1970, this ion has become increasingly available for populations with and without fluoridated drinking water, in a wide range of vehicles such as dentifrices, mouthrinses, supplements, infant formulas, and industrialized beverages, besides to dental products for exclusive professional application. India being a demographic country has a wide range of diversity in fluoride levels in different parts of the country. In India, Coke and Pepsi have a combined market share of around 95% directly or through franchisees. The 50-billion-rupee soft drink industry is growing now at 6–7% annually. There are two distinct segments of the market, cola and noncola drinks. The cola segment claims a share of 62%, while the noncola segment includes soda, clear lime, cloudy lime, and drinks with orange and mango flavors. The per capita consumption of soft drinks in India is around 5–6 bottles. It has been documented that all India production of aerated soft drinks is about 900 crore bottles per year, of which the production of carbonated soft drinks is about 70%, i.e., 630 crore bottles. The US flavoring syrup and concentrate manufacturing market is dominated by two main players, who made up 73% of the total US market share in 2010: The Coca-Cola Company (40%) and PepsiCo, Inc., (33%), and the remaining 27% of the market is composed of a variety of smaller companies. Change in lifestyle and urbanization have promoted the increased intake of drinks and beverages. Fluoride dosage varies according to the age of the child and fluoride concentration of drinking water. In 1986, the American Academy of Pediatrics stated that for optimal dental health benefits, the total daily intake should be 0.05–0.07 mg F/kg body weight and to avoid the risk of dental fluorosis, the fluoride intake should not exceed a daily level of 0.10 mg F/kg body weight. Different brands of carbonated drinks available in the market have variable content of fluoride. Studies have shown that nowadays, children take more beverages or carbonated drinks. Globally, the production, as well as consumption of carbonated beverages, has increased in India. Some investigations have suggested that increased consumption of carbonated soft drinks are a form of systemic fluoridation and have been implicated as risk factors for dental fluorosis in young children. Therefore, the aim of this study was to analyze the fluoride content in carbonated soft drinks that were commonly available in Chandigarh city, India. Twelve brands of commercially available each soft drink were purchased from different places of market in Chandigarh city. All the bottles were stored in a cool place for fluoride estimation. Each bottle was given different codes (Group I, Group II, and Group III) according to the place of purchase. The commercially available brands included Pepsi, Coke, Sprite, Fanta, Mirinda, 7 Up, Limca, 7 Up Nimbooz, Mountain Dew, Diet Coke, Diet Pepsi, and Thumps Up. The soft drinks were firstly decarbonated by placing each sample in a plastic vial loosely covered for 12 h. Then 1 ml of each sample was removed and to it 1 ml buffer solution was added. The fluoride concentration of the sample and buffer combination was then determined using a fluoride ion specific electrode. The fluoride content in each bottle was estimated using fluoride estimation kit (fluoride test strips Quantofix 37211 Fluka; Sigma-Aldrich). The reaction is based on the bleaching action of fluoride ions on an aluminum color complex. The fluoride test is especially suited for rapid control of fluoride concentrations. Its purpose is to define concentration range and to detect values which fall short of or exceed given limits. The color changes from red to white color due to the presence of chlorates and bromates. The kit included a total of 30 fluoride test strips. The results were analyzed using SPSS package version 17.0. (SPSS Inc., Chicago IL, USA). The fluoride concentration was estimated in different carbonated soft drinks. The fluoride concentration ranged from 0.12 to 0.42 mg/l. According to the manufacturing brands of the companies, the mean fluoride level was found to be higher in Coke (0.34 mg/l F) and Pepsi (0.22 mg/l F). The highest mean fluoride concentration was found to be highest in Thumbs up (0.42 mg/l F) and least in Diet Pepsi (0.12 mg/l F). Not much difference was observed in the rest of the sample products [Table 1]. 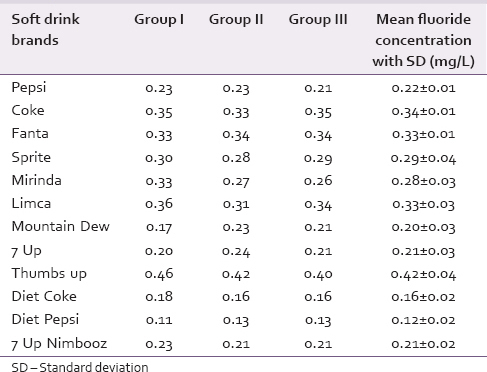 This study was designed to determine the fluoride levels in different carbonated soft drinks that were readily available in Chandigarh city. Foods, beverages, carbonated soft drinks, and dental products are considered as the main sources of fluoride intake for children above 1 year of age. These drinks can affect ones dental health in one of the following three ways: The child may receive an appropriate level of fluoride from the above-mentioned products, allowing for optimal caries prevention, or receive suboptimal levels of fluoride, with a resultant increase in dental caries. Finally, an elevated level of fluoride in a child's consumption would result in fluorosis. When considering carbonated soft drinks, the concentration of fluoride was found to be 0.12–0.42 mg F/L. This finding was slightly lower than that in the study conducted by Jimenez-Farfan et al. and slightly higher than that reported in the study by Martínez-Mier et al. The permissible limit as given by Bureau of Indian Standards and World Health Organization is 0.6–1.2 mg/l and 1.5 mg/l, respectively, for fluoride in drinking water., The fluoride concentration in the community water supply in the study conducted by Dhingra et al. ranges from 0.11 to 0.26 mg/L with mean fluoride concentration of 0.17 mg/L. This result was in agreement with the previous studies conducted by Lalumandier and Ayers. According to the water quality standards for drinking water in India (IS 10500:1991), the maximum permissible limit of fluoride in drinking water is 1.2 mg/L. In the light of the result obtained, the fluoride levels of the community water supply were in the range of permissible limit for fluoride in drinking water. The difference between fluoride values found in this study, and those reported previously in literature suggest that the composition of the beverages is not uniform or necessarily consistent. This different fluoride concentration in cola drinks may be due to water from different sources containing different fluoride concentrations that were used in the manufacture of these beverages. However, dental fluorosis is reported in the different parts of India with various levels indicating the need for controlling fluoride intake, especially in children below 6 years of age. The results of this study suggest the need for controlling the production of the drinks with respect to fluoride concentration. Specific standardization of the product labels is also needed, by obligating manufacturers to present clear information about fluoride concentration in the products because the widespread consumption of certain beverages along with other sources of fluoride intake could lead to an increase in the prevalence of dental fluorosis. In view of the differential level of fluoride, as shown in this study results, it can be concluded that regulation of an optimal range of fluoride in bottled carbonated soft drinks should be drawn for the Indian scenario. Buzalaf MA, Cury JA, Whitford GM. Fluoride exposures and dental fluorosis: A literature review. Rev Fac Odontol Bauru 2001;9:1-10. Pendrys DG, Katz RV, Morse DE. Risk factors for enamel fluorosis in a nonfluoridated population. Am J Epidemiol 1996;143:808-15. Niir Project Consultancy Services (NPCS), Soft Drink Industry in India; 2012. Available from: http://www.niir.org/. [Last assessed on 2014 Jun 08]. Kaczanowska A. Soda Production in the US. IBIS World Industry Report, 31211; 2010. Available from: http://www.ibisworld.com/industry/default.aspx?indid=285. [Last accessed on 2014 Jun 08]. Kopylovsky D. Syrup and Flavoring Production in the US. IBIS World Industry Report, 31193; 2010. Available from: http://www.ibisworld.com/industry/default.aspx?indid=275. [Last accessed on 2014 Jun 08]. Toumba KJ, Levy S, Curzon ME. The fluoride content of bottled drinking waters. Br Dent J 1994;176:266-8. Jimenez-Farfan MD, Hernandez-Guerrero JC, Loyola-Rodriguez JP, Ledesma-Montes C. Fluoride content in bottled waters, juices and carbonated soft drinks in Mexico City, Mexico. Int J Paediatr Dent 2004;14:260-6. Thippeswamy HM, Kumar N, Anand SR, Prashant GM, Chandu GN. Fluoride content in bottled drinking waters, carbonated soft drinks and fruit juices in Davangere city, India. Indian J Dent Res 2010;21:528-30. Martínez-Mier EA, Soto-Rojas AE, Ureña-Cirett JL, Stookey GK, Dunipace AJ. Fluoride intake from foods, beverages and dentifrice by children in Mexico. Community Dent Oral Epidemiol 2003;31:221-30. Bureau of Indian Standards. Indian Standard Drinking Water Specifications. New Delhi: IS: 10500; 1983. Available from: https://law.resource.org/pub/in/bis/S06/is.10500.1991.html. [Last accessed on 2014 Jul 05]. World Health Organization. Guidelines for Drinking Water Quality, Recommendations. Vol. I. Geneva (Switzerland): WHO; 1984. Available from: www.who.int/water_sanitation_health/dwq/gdwq3rev/en/. [Last accessed on 2014 Jul 05]. Dhingra S, Marya CM, Jnaneswar A, Kumar H. Fluoride concentration in community water and bottled drinking water: A dilemma today. Kathmandu Univ Med J (KUMJ) 2013;11:117-20. Lalumandier JA, Ayers LW. Fluoride and bacterial content of bottled water vs tap water. Arch Fam Med 2000;9:246-50. IS 10500. Indian Standard Drinking Water-Specification; 1991. Available from: http://www.bis.org.in/bis/html/10500.html. [Last accessed on 2014 Jul 05].